The Pompeii slot has five standard reels to play with. There are no classic winning lines provided in the slot, however, it does have 243 options for building prize combinations. The drums have a clear separation, so the player will simply navigate the playing field. The slot symbols are matched to the style. During the gameplay, each of them is replaced by pictures of a golden coin, a shield and a sword, a battle chariot, a helmet, a volcano of Vesuvius, which destroyed the glorious city. Fascinating graphic design will help you to travel around the ancient Roman civilization and feel out its atmosphere. Behind the reels you can see the marble columns, the temple in honor of the Roman god, the triumphal arch. You can also see an erupting volcano that destroyed all the architectural buildings along with those who erected them at the top of your screen . All shades of brown color prevail in the color range. Amazing graphics and extraordinary musical accompaniment give a complete picture of real events and make your gambling experience even better. You won’t need to worry about the struggles with the control panel, because it seems to be very easy even for beginners, and even more so for experienced players. The Spin key is responsible for triggering the drums. The purpose of the Auto Spin button is to start the auto-play mode. In order to determine the size of the bet, that is the number of coins for the upcoming round, there is Credits per Spin key provided. The denomination of coins will help establish Denomination. The rules of the game, the value of symbols and other features of the Pompeii game slot can be studied in a special section that opens the Pays key. The action algorithm in the virtual slot Pompeii is no different from other gaming machines. The user only needs to decide on the number of coins and their denomination that will be used in the upcoming round as a bet. The size of the contribution can be changed with each new launch, or leave unchanged throughout the game. As it was already mentioned above, the slot has 243 variants of prize combinations. In a winning combination, there must be at least three (in some cases, two) identical symbols. A prerequisite is to build a combination from the first reel. If the playground, however, does not have a certain symbol to finish the combination, but there is a volcano icon on the screen ( it plays the role of a wild sign), then it can replace it and the situation changes radically. The gold coin on the reels is a symbol with special functions. When at least three bonus symbols appear on one screen, the player gets up to ten free spins. Four special icons earn 15 bonus spins. Five pictures with a gold coin can earn you up to 20 bonus spins. A feature of the round is that each payout will be multiplied by a factor of x3 or x5. This indicator depends on which of the drums fell wild sign. If Wild appeared on the second reel and participated in the composition of the prize combination, then the payout will be tripled, if on the fourth, it means an increase of five times. The round of bonus spins will be prolonged in the event that the key combination of bonus symbols is lined up on the playing court. 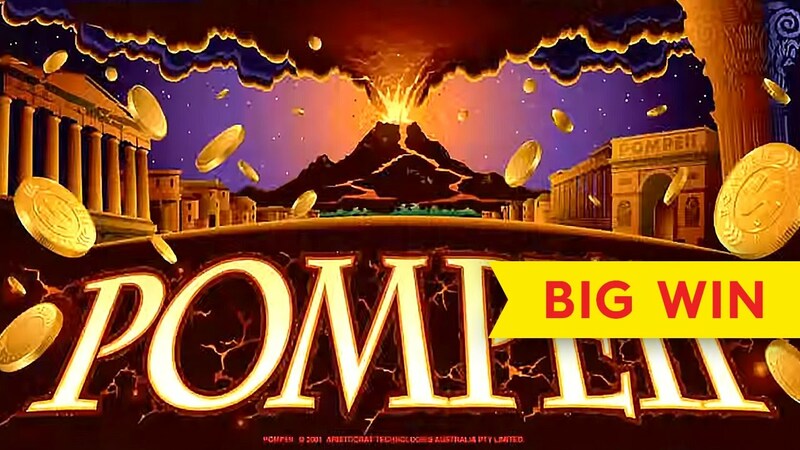 There are no thematic bonus games introduced in the Pompeii slot. Sadly, risk games are also not available, so all of your wins are directly transferred to the participant’s account. Thanks to the autorun mode, the player can take a short break. Even if he decides to leave the virtual slot for a couple of minutes, it will not affect the gameplay. Drums continue their rotation, and the balance will also be replenished. Just select the number of automatic spins, five, ten or one hundred. Slot machine Pompeii is mainly for those who are interested in events that had a tremendous historical significance. Colorful graphics, detailed drawing of the details and animation of the characters will allow you to fully plunge into the atmosphere of the past century. It will be much more interesting to rotate the drums under the clatter of the hoofs of war horses. Virtual slot Pompeii will bring new knowledge about ancient Rome to those who have not previously received such information. The device will be interesting to fans of the Call of the Colosseum online machine as an opportunity to learn not only about the greatness of Roman civilization, but also about its tragic events. Frequent loss of prize combinations is a real gift for gamblers. Each rotation will significantly improve financial performance, which fully compensate for the absence of the bonus game. The generosity of the Pompeii gaming machine will have a significant impact on the user's mood.